Am Shalom’s mission, as a Reform congregation, is to engage, enlighten, embrace and educate our members in ways that build a sense of community, while respecting individual forms of expression and belief. We seek to explore our Jewish roots, awareness and values, and enrich the spiritual lives of our members, while serving humanity through social action. Am Shalom (People of Peace), a Reform congregation, was established on June 18, 1972. Its first formal Shabbat Service was held on August 4, 1972. 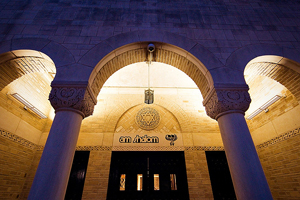 Am Shalom began when sixty families, who shared certain common concepts of Jewish worship and living, came together to create a new and vibrant Reform congregation. Under the leadership of founding Rabbi Harold L. Kudan, who retired in 2002 after 30 years of service, and current Senior Rabbi Steven Stark Lowenstein, Am Shalom has grown from those original sixty families to its current membership of 950 families. In its beginnings, the congregation's offices were in a small storefront. Today, the synagogue makes its home in the newly renovated historic building at 840 Vernon Avenue in Glencoe, Illinois.